Web accessibility is the requirement to create websites that can be accessed and understood by as many people as possible. You can relate it to the accessibility of a room in a university. Every student has to be able to access the room regardless of injury, disability or other hindering circumstances. A lot of schools had to build ramps to allow students in wheelchairs easier access to the facilities. Please look up what impairments and disabilities are the focus of accessibility! Make sure to code your websites to W3C web standards to allow for the widest range of web browsers. Colour blindness is a common problem today with sources claiming that most people have levels of colour blindness. It affects mostly males, and it is excepted that about 10% of males have some form of colour blindness. Any time you use colour to convey information in an interface also use clear, secondary cues to support the information. Spend 10 minutes to find websites that help with contrast and colour blindness. List 5 sites that help with contrast and 5 sites that help when designing for accessibility and colour blindness. Add your links to this post in form of a comment! See also below: Accessibility Validation! If a visually impaired user is trying to access your web page they rely on screen reader software. Using the alt attribute allows all users to get an idea of the image regardless if they can view it or not. What could be other reasons for users not to be able to view images? Click on this W3Schools Link and access the TryIt-Editor. Read the code for inserting an image and try to rewrite it from memory adding a descriptive alt attribute. I will walk around and look at your results. Drop-down menus are a smart way to navigate. Drop-down menus tend to look very attractive. Many successful websites avoid their use in total: eBay, Yahoo!, Amazon. Drop-down menus are bad for accessibility. Using the example of bold text and strong text, the code for bold <b>I love Football!</b> boldens that section. Using the code for strong has the same visual impact, but the difference is quite important. If you write <strong>I love Football!</strong> it will look bold, but a speech reader will interprete the text as important. So, use strong rather than bold. The old style of a tag is not self-closing: <br>. This is the tag for a line break and most browsers will have no trouble to read it. The web standard-compliant version is self-closing: <br />. Start to use self-closing tags to ensure that your websites will show on the widest range of web browsers in the future as well. Site maps are a good way to support accessibility. Anyone with trouble navigating your site will benefit from a clear, text-based site map. 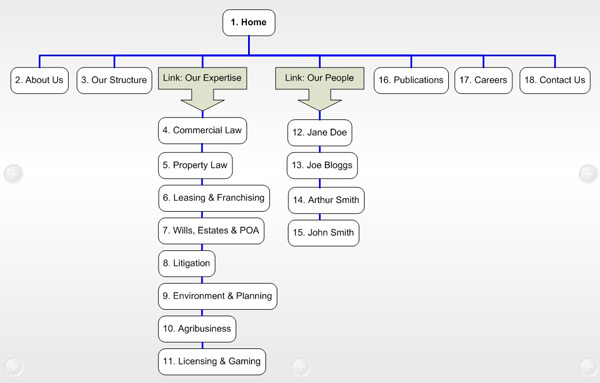 What is a site map? It is an index or guide to the different pages and hyperlinks on your website. Read here for Tips on Sitemaps Example of WAI Sitemap – is it too complex? Read the updates below on the weekend! Make sure to use text size that is suitable for a variety of users. Smaller text looks neet and modern, but not everyone will be able to read small text (think of older users). Recommendations regarding the ideal text size vary significantly: various sources recommend sizes for body text (main text) from 12px-14px as well 16px. W3Schools recommends a default size for paragraphs of 16px. With a change towards responsive web design, a design approach that aims at flexible website dimensions to provide an optimal viewing experience on any platform, there has also been a shift towards maesuring text size in em, rem or in percentages. Text set in em or rem (they are different) can be resized by all browsers, which allows for ideal viewing on a screen as much as on a tablet or mobile phone. It is important to check your website for accessibility! Make use of one of several online accessibility validators. Bobby used to be the most successful free online validator, which has been disabled recently by IBM. Automated validators give only an indication of the accessibility of your website. Accessibility is measured at three levels from basic accessibility to advanced: A, AA, AAA. Each level relates to a priority checklist that can be found at: W3C website. A Web content developer must satisfy all priority 1 points. This will give the site a Level A-Accessibility rating, which can be labeled on the website. A Web content developer should satisfy all priority 2 points. This will give the site a Level AA-Accessibility rating, which can be labeled on the website. A Web content developer may satisfy all priority 3 points. This will give the site a Level AAA-Accessibility rating, which can be labeled on the website. There has been a problem with Flash content online. Flash content has not been accessible until later versions of Adobe Flash. If you use Flash make sure to provide the content in alternative format. It is recommended to describe your Flash file (SWF) in words by offering users a link to a text version. The W3C has declared its intention to create a Semantic Web, meaning a World Wide Web of structured data, that is transparent. Using ‘Semantic Markup’ means that you will write HTML that is self-descriptive and written for other humans rather than just for machines (software, parsers, Google etc). Semantic Markup means that HTML code is used appropriately. This is achieved by using the HTML standard classes accordingly: <h1> will be used for the main heading followed by <h2> and these tags will be used for headings and not to emphasise or enlargen text. <p> will be used for a paragraph (rather than <br /> for line break). Above I mentioned the examples of using <strong> rather than <b> to emphasise text. The same applies to the <em> tag (which actually stands for emphasis, while strong represents prominent text) to be used rather than the <i> tag which stands for italic or sloped text. The point is that <b> and <i> are purely representational or visual, while <strong> and <em> offer semantic meaning that will be interpreted differently by screen reader software. The other point is that the visual representation for <strong> and <em> may change over time from bold and italic to something else (eg high-lighted). You can also add comments to important sections of your code. Comments will only display in your HTML code and not on your website. The use of comments is to help understand long passages of code. Other team members will benefit. But it also helps understanding code that you wrote a while ago. Finally, here is a checklist that you may want to use. Use descriptive links (avoid ‘click here’) This is important for users with visual impairment who rely on screen reader software. Use the W3Schools TryIt Editor and Notepad to create the home page for a website of your choice with HTML and CSS. menu with 5 menu items. The menu items need to be links. Link them to a file with the name of the menu item (it will be an incomplete link). footer with a Copyright statement including this year and your name. The images can be sourced online. Please aim for Creative Commons images. You may use www.morguefile.com or other websites for this purpose. Work on the assessment in class and during the week and have ready to be handed in as html file. The CSS component can be either internal or as an external CSS document. Note: Add the closing tag straight away to make sure that you do not forget it! It is important to sketch out your site beforehand. Write down all the dimensions for the various elements. 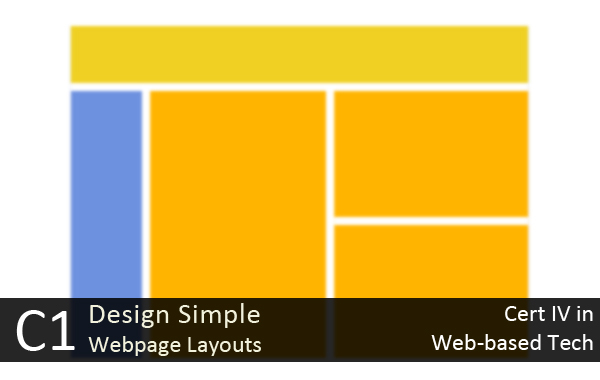 Overall dimensions, example: width 960px x height 690px, dimensions of the banner/header, dimensions and format of the menu, dimensions of various content boxes. Divs are basically spaces that you reserve. They are like 2D boxes that allow you to place content, either images, text, video or audio. You can give the background a colour and you can create outlines. We will use this class to inprove your Photoshop skills and you will be able to work on your website designs for class C1. Assessment 2 will be conducted next term when you will have a better understanding of how to upload web content. You will have time to work on assessment 1 in class. I will be available to offer assistance and answer questions. Use the supplied links to follow the instructions on W3Schools: http://www.w3schools.com/css/css_font.asp. Use the supplied links to follow the instructions on W3Schools: http://www.w3schools.com/html/html_tables.asp. Use the supplied links to follow the instructions on W3Schools: http://www.w3schools.com/css/css_table.asp. Use the supplied links to follow the instructions on W3Schools: http://www.w3schools.com/html/html_lists.asp. Use the supplied links to follow the instructions on W3Schools: http://www.w3schools.com/css/css_list.asp. Use the supplied links to follow the instructions on W3Schools: http://www.w3schools.com/html/html_blocks.asp. Use the supplied links to follow the instructions on W3Schools: http://www.w3schools.com/html/html_layout.asp. Please look at this W3Schools example: Basic website created with div elements and change it to create a simple text based website for yourself. Call it something like ‘My first website’, supply a menu with menu items (about me, portfolio, etc) and change dimensions and colours. Add more divs to the HTML. Save your final work with Notepad as a HTML file and bring to next class! Develop a detailed SEO recommendation for AntiArt, a Melbourne-based website that retails illustrations, screen prints, lithographs and other Art prints by international, non-established and non-commercial artists and illustrators. The website will have sections based on the different print formats and sections based on the cultural origins of the artists (European, Australian, Aboriginal, Chinese, Indian, Latin American). Clients need to be able to place orders for specific, unique and numbered art pieces. The website will be available in English only. The prints will be stored in Hong Kong and shipped from there. The website will promote Melbourne as the home base. Please use the Google Search Engine Optimization Starter Guide as a reference. Create a unique, accurate page title for the home page!Describe your choice and why it is suitable for SEO. Create a unique, accurate page title for the page on which clients can purchase screen prints!Describe your choice and why it is suitable for SEO. Create a unique, accurate page title for the page on which clients can purchase art by European artists!Describe your choice and why it is suitable for SEO. How can you write description meta data for a web page?Create an example in code. Give an example of a good URL for the page for purchasing screen prints! List a set of keywords you would use for the home page! We will continue working through the CSS section on W3Schools: http://www.w3schools.com/css/default.asp. By now you should understand the purpose or function of CSS. It is mostly responsible for the styling of online documents. CSS is also responsible to view documents for different platforms and outputs. Having CSS allows you to change the font, image sizes, layouts to suit different requirements. The ideal size for a font will be different if viewed on a widescreen monitor or on a mobile phone. We will go through the Styling related tabs as well as the box model. I will ask you to trial the different options as we work through to the Box Model together. NOTE: In class we worked through the Styling Backgrounds and Styling Text Tabs. We wook time to look at a number of CSS related aspects and we spend a good time exploring the Styling Backgrounds examples. Trial the links above and change the code from background-position:right top to left top and change the margin to margin-left:240px. Play around with the settings and observe the changes by submitting them in the TryIt Editor. Due to me being sick I would like you to work individually through Google’s SEO Starter Guide. Please work through pages 14 – 19 on your own. This will include information on how to write better anchor text and how to write descriptive alt attributes for images.